It's one of the most iconic theme songs in video games. It's been performed by everything from high school bands to world-renowned orchestras. And yet, I feel like something has always been... missing. That thing? Cowboys. Definitely cowboys. 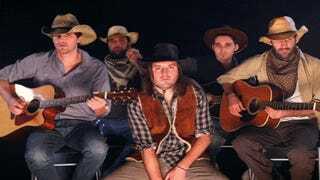 Warp Zone's cowboy shtick is fun, but this is also a damn good acoustic rendition of Halo's (typically) haunting anthem. Now I kinda want an album that's "Gaming's Greatest Hits (Ft. A Yee-Hawing Band Of Cowboys)." My eyes have been opened to the possibilities. Now if you'll excuse me, I'm off to go play Dragon Age with a washboard and a moldy moonshine jug. Just like the pioneers before me.